'Dancing With the Stars': Who Went Home After Face-Offs? ‘Dancing With the Stars’ Results Recap: Who Were the Second Couple to Go Home? Go big or go home! It seemed that every couple tried to do exactly that in Dancing With the Stars&apos; Face-Off competition on the previous episode, but on the results show on Tuesday, September 27, the second couple of the season did, indeed, go home. During the two-hour episode, former pro Kym Johnson-Herjavec stepped in for Erin Andrews. Kym did a great job, despite having gone a little overboard (read: a lot overboard) with the tanning cream. Before the results were announced, however, viewers got some insight as to why some couples fared better than others the night before. As usual, the judges had plenty to say about plenty of things. Kenny "Babyface" Edmonds and Allison Holker did a fine job with their jive, but Len thought they needed to be "sharper," and basically all the other judges agreed. Up against them were Jana Kramer and Gleb Savchenko. Though Jana got off to a rocky start, Len thought she saved it with on-point footwork, and they took home the immunity. Tom Bergeron then delighted everyone by flashing an underwear pic featuring Gleb and Artem Chigvintsev. Julianne Hough fangirled over James Hinchcliffe during his performance with Sharna Burgess, but Bruno Tonioni thought his footwork could have been better. That said, all of the judges agreed that they beat Ryan Lochte and Cheryl Burke (though Ryan&apos;s 95-year-old Cuban grandmother wins for most adorable grandmother … ever). 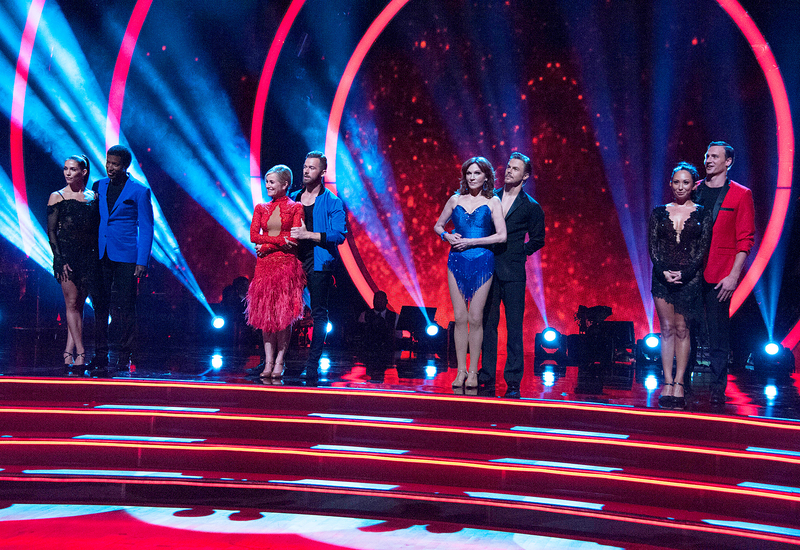 Terra Jolé and Sasha Farber delivered an emotional routine that all of the judges found inarguably beautiful, but they went up against Calvin Johnson and Lindsay Arnold, who managed to give an even stronger performance. Once again, Julianne fangirled over the hot guy. Amber Rose and Maksim Chmerkovskiy were supposed to do a salsa routine, but the judges thought it was more like hip-hop. Len commented, "She was first in line when they were giving out booties." Maureen McCormick and Artem&apos;s salsa wasn&apos;t earth-shattering or anything, but Bruno appreciated that it was at least an actual salsa, and they were rewarded with immunity. Laurie Hernandez and Val Chmerkovskiy wowed the judges with their clean lines, but Carrie Ann Inaba was not impressed that they did a lift. Marilu Henner and Derek Hough had a strong showing as well, but they couldn&apos;t edge ahead. Finally, they got around to the results (on the results show). Safe couples included Marilu and Derek, Babyface and Allison, and Ryan and Cheryl — which seemed to surprise a lot of people, including Ryan and Cheryl. This left Amber and Maks, Rick and Emma, and Terra and Sasha at risk of going home. After as much build-up as possible, finally the only result that really mattered was announced — and Rick Perry and Emma Slater were eliminated. This wasn&apos;t much surprise, since he&apos;s struggled from the beginning and is basically as stiff as a board. After giving Amber Rose a weirdly long goodbye hug, Rick said he "promised" to "look good on the dance floor" for his daughter at her upcoming wedding. He then urged everyone to support veterans. Tell Us: Do you think Rick Perry deserved to go home? Dancing With the Stars next episode airs on ABC Monday, October 3, at 8 p.m. ET.